Here you see the ingredients for my second Slow Cooker cookbook test recipe. I'm trying to balance the dishes I make so I get a broader feel for how the recipes are going to come out. The first recipe was the Lucky Chili (not so lucky). These here vegetables are for Ratatouille. My mother discovered Ratatouille when I was in high school. 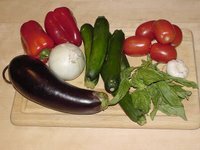 At that time, we'd only recently discovered zucchini and eggplant was something we'd only heard about but hadn't yet seen. Ratatouille (can you tell I like typing this word?) was one of the rare dishes where it actually paid off that my mother didn't particularly like to cook and spent as little time as possible in the kitchen. She always threw dinner together at the last minute so sauces and stews had little time to thicken. It wasn't until I was living on my own and left my spaghetti sauce on the stove for a couple of hours that I discovered you weren't supposed to have that greasy-orange puddle of water lying on the plate under your spaghetti. It worked for the Ratatouille, though, because zucchini can overcook by the time you type the word Ratatouille, and her zucchini was always nice and firm in her ratatouille. I only made this dish from my mother's recipe once, and it didn't turn out so well. It took so long to cook the eggplant that the zucchini disintegrated into the sauce. So when I saw a recipe in Not Your Mother's Slow Cooker Cookbook that guaranteed that the vegetables would hold their shape, I thought this would be a good recipe to test for my cookbook review. Alas, it was not so. I don't know if you can tell by looking at the picture, but those vegetables are holding on to their shape for all they're worth, and every time I scoop out a serving several more zucchini give up the ghost. I cooked it on low for the shortest suggested periods of time for each section. 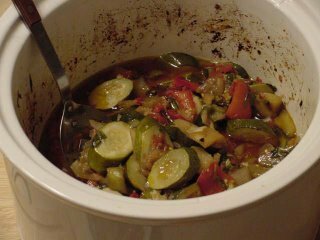 An hour after I added the zucchini (which should have left another hour of cooking) I uncovered the pot to add the basil, salt and pepper. At that point the zucchini was fine and still on the raw side so I figured it would be fine the rest of the way. It was not. It was also very oily. It calls for half a cup of olive oil, which didn't seem like that much when I put it in and mixed it with the vegetables. But when it was done and the liquid had cooked out of all the vegetables, it seemed like there was a half-inch of oil lying on top when I spooned it out to use it with the couscous. I was able to get rid of it, but I'm wondering if a fourth of a cup might not be enough next time. I also misread the ingredients and only bought five tomatoes instead of ten, so those became salad tomatoes and I used a 14.5-oz. can of diced tomatoes instead. I think it would be worth the investment to use fresh, though, so I will also make sure to buy enough next time. The good news? This was really good. I think I'll add the basil and seasonings half an hour after adding the zucchini, then cook for just half an hour more the next time I make it. It was especially good with whole wheat couscous made with the liquid from the Ratatouille. And that odd flavor in the Lucky Chili I thought might just be the way things taste when you make them in the slow cooker? I didn't notice it here, so it must just have been that particular recipe. Put cubed eggplant in colander and sprinkle with salt. Let stand 1 hour to drain. Press out excess moisture with back of spatula and pat dry with paper towels. Combine eggplant, onion, bell peppers, tomatoes and garlic in the slow cooker. Pour olive oil over mixture and toss to coat. Cover and cook on HIGH for 1 to 1-1/2 hours, or on LOW for 2-3 hours. Stir in zucchini. Cover and continue to cook on HIGH for another 1-1/2 hours, or LOW for 2 to 2-1/2 hours. The last hour, add basil and season with salt and pepper. The vegetables will be cooked but will still hold their shape.